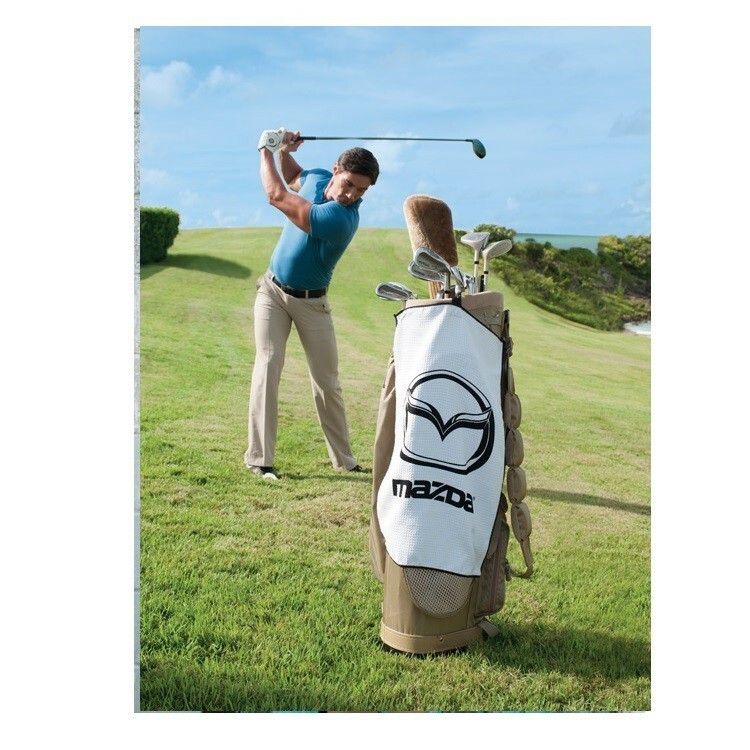 At 16" x 24", this unique golf towel features a FREE Versa-loop twill strap for easy hanging. 100% cotton velour, 2.3 lbs./doz. White only. Finally, the ability to let your imagination run wild...on absorbent velour Turkish combed cotton blended towels. 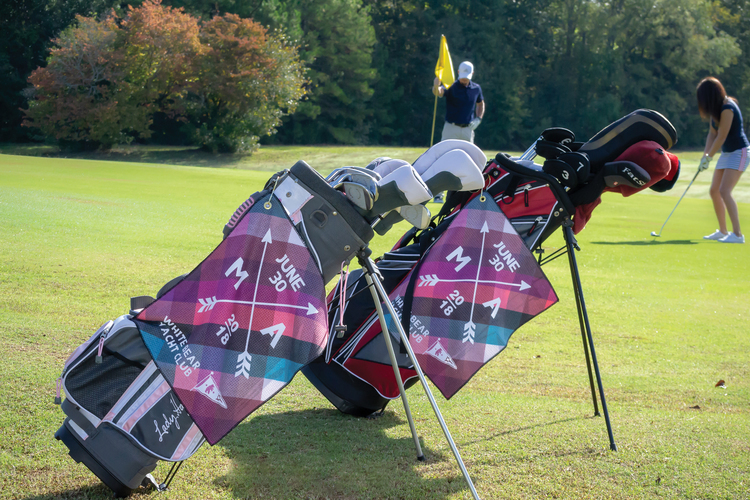 With ColorFusion™ towels, we offer domestically printed edge-to-edge designs in vibrant colors with a low 36-piece minimum. Whether you want an unlimited number of spot colors or flawless reproduction of a full color photograph, ColorFusion™ is your solution. 16" x 24", 2.5 lbs./doz. No more clunky metal hooks and hardware - each towel has its own sewn in loop for easy hanging. FREE set up with 144 or more towels. 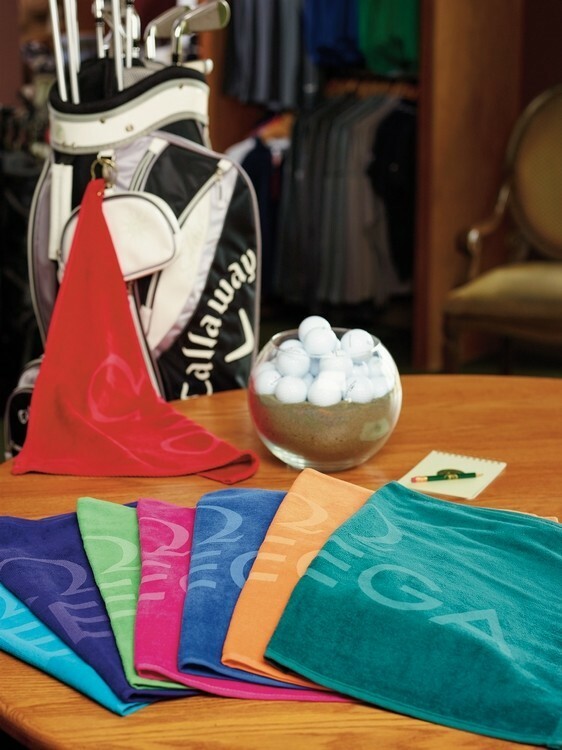 Colored golf towel. Turkish Signature midweight. 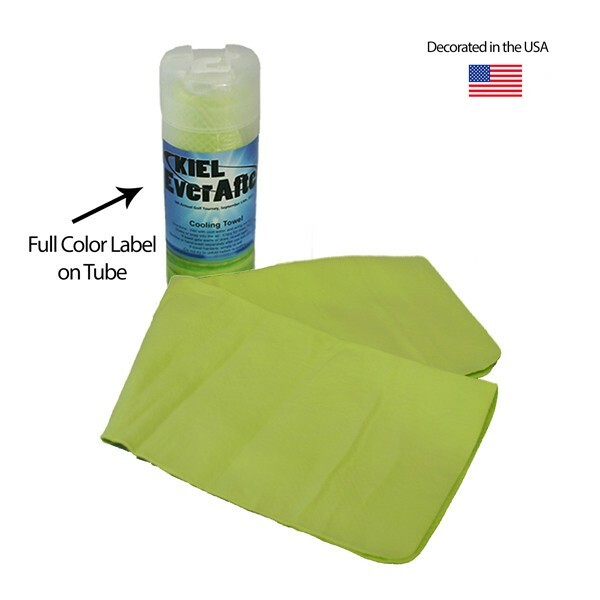 This durable towel will last for years to come. Each towel is 100% cotton, double sheared with dobby end hems. 16" x 24". Product Colors: White, pink, tangerine, red, black, navy, royal blue, forest green, athletic gold, purple, light blue, beige, fuchsia, turquoise, lime, yellow, grey, maroon, evergreen. Blank prices are for colored towels unless otherwise indicated. This towel is made of cooling fabric. 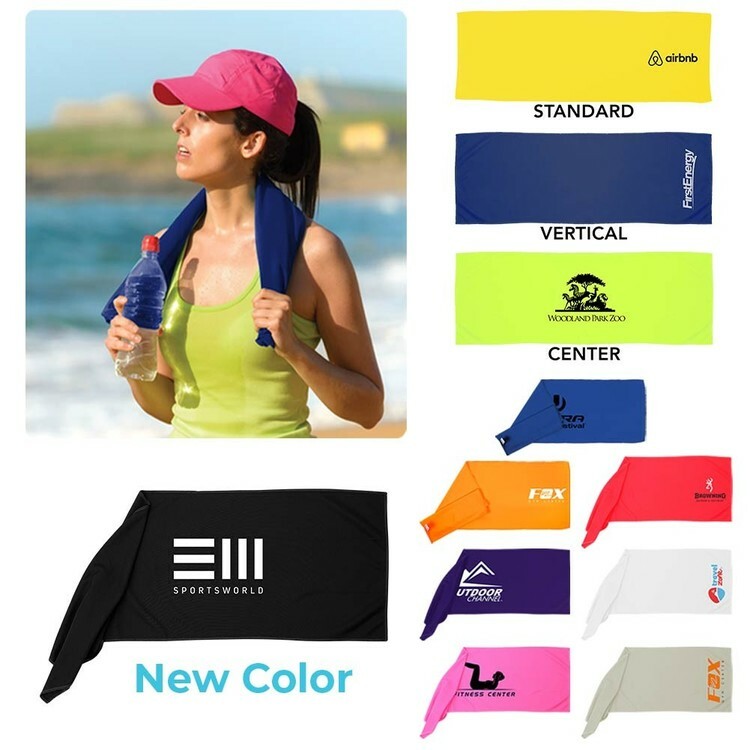 It can work as like a charm as golf club head cover, cooling bandana or neck wrap, easy to tie if you will be moving around a lot, you will have amazing summer with this cooling towel, simply soak, wring out and snap it, activate cooling ability less than 30 seconds and stay cool for hours and provide UV protection for your neck or head. It is a good promotion gift and can customize your own logo. 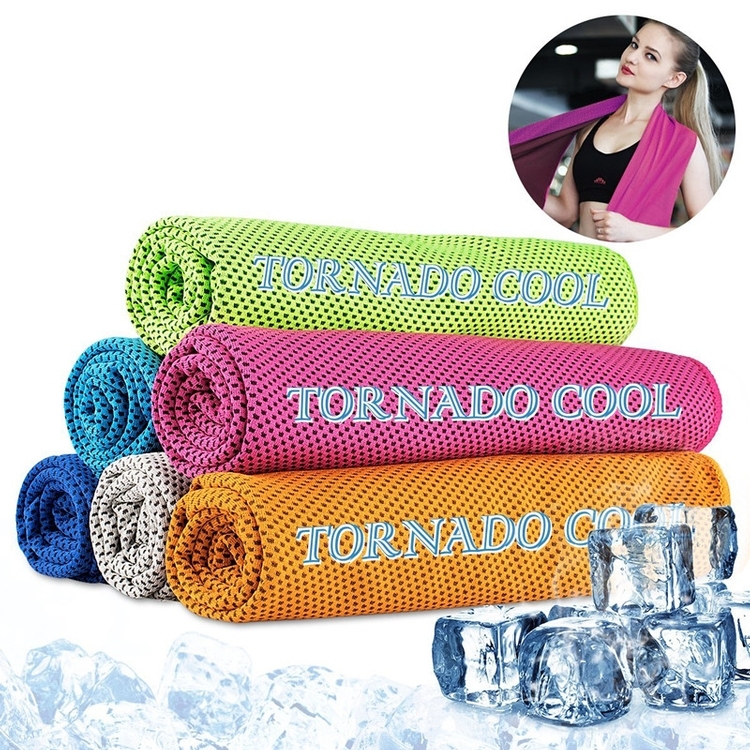 The Cooling Towel keeps you cooler when working out in the gym or when outdoors playing sports or participating in other activities in the heat. Simply wet with water and wring to activate. The specialized air pocket construction quickly absorbs and retains water better than standard materials, and enhances air flow into the damp cloth creating a prolonged cooling effect. 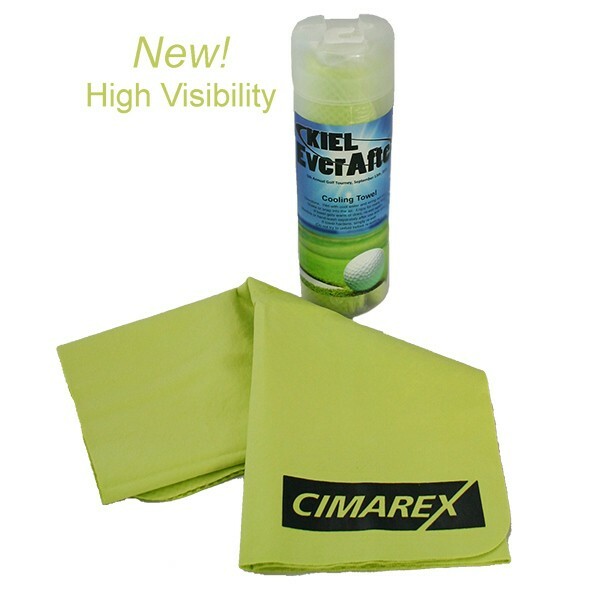 The moisture wicking properties draw moisture away your skin so you stay dry and comfortable. Ideal choice for charity walks, golf tournaments, or other activities. Hand towel, 3.5 lbs. per dozen. Made of 100% luxurious Velour cotton. 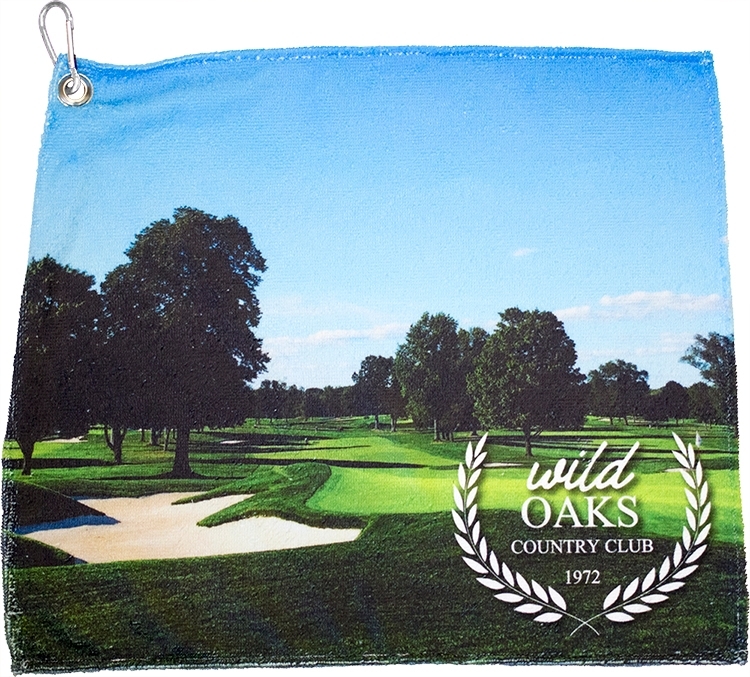 16" x 25" hand towels are a great give away at charity events, golf tournament, or holiday gift. 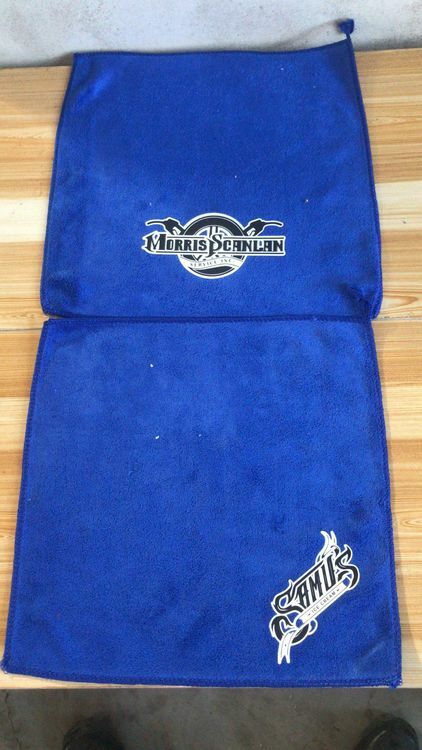 Turkish Hemmed Golf Towel 11"x18"
Hemmed 12?x 17? 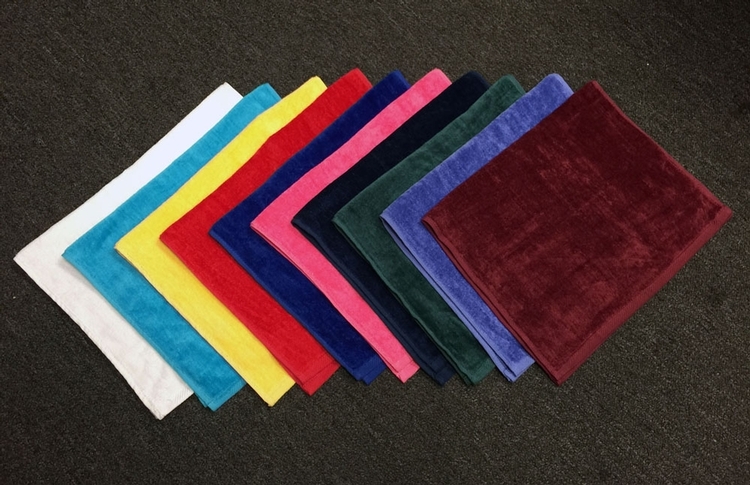 velour, 1.25#/dz towel with hook and grommet. Available in white (G1217HWH) or black, navy, and evergreen (G1217DKH). Also available with longer lead times in: light blue, beige, fuchsia, turquoise, lime, tangerine, yellow, gray, royal blue, red, maroon, gold, purple and pink (allow 10-15 day turn). 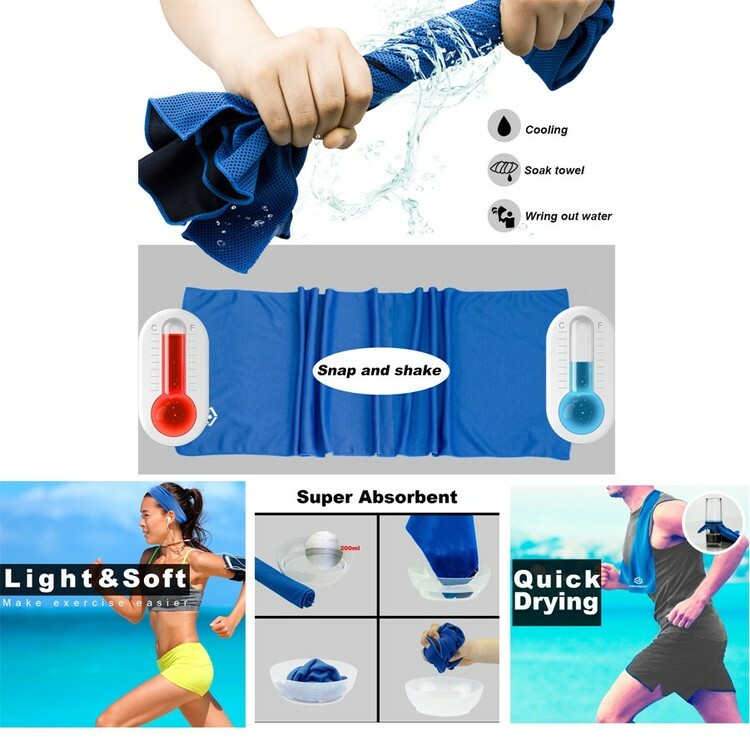 Cooling Towel is made of filament polyester cool sense. The cooling towel can offer you a cosy feeling after sport. 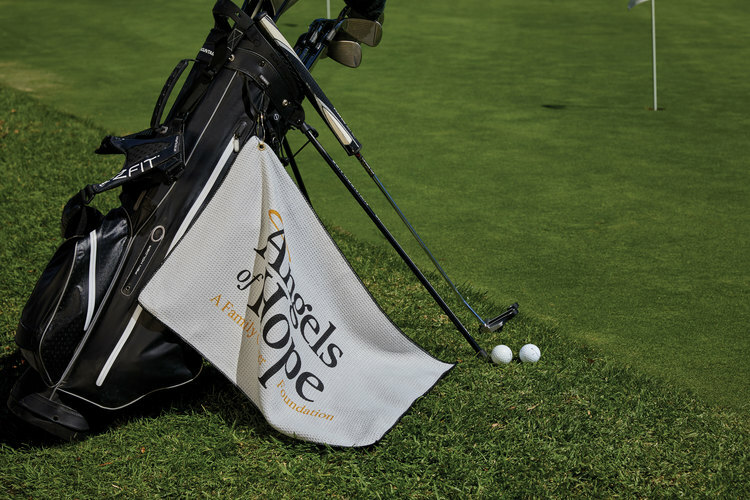 The high-tech fabric of this towel instantly cools when wet with water or perspiration — making it an ideal choice for charity walks, golf tournaments. The towel is packaged with plastic box, makes it easy take along. Terry velour hemmed 16x25 Sports/ golf towel white. 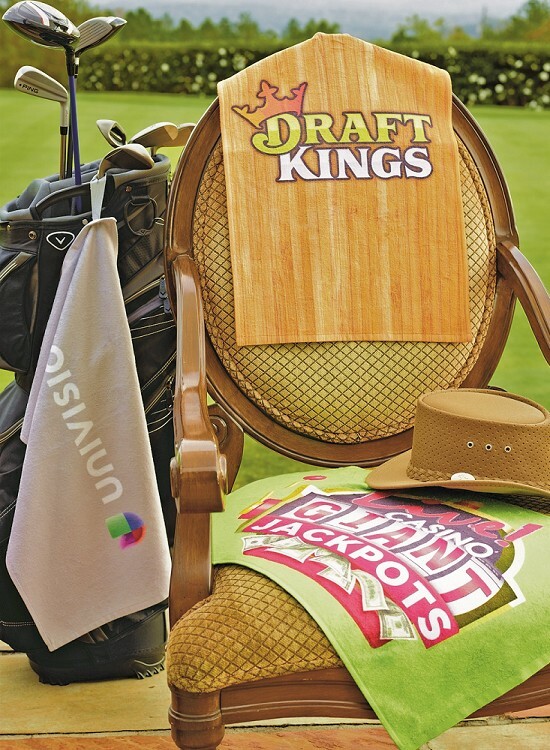 This perfect inexpensive sports & golf towel is an excellent choice for golf tournaments soft absorbent ideal for games stadium give away basketball football rally towel smooth velour finish for excellent printing results best for self promotion trade show convention family reunion school college team towel can be grommet & hook. 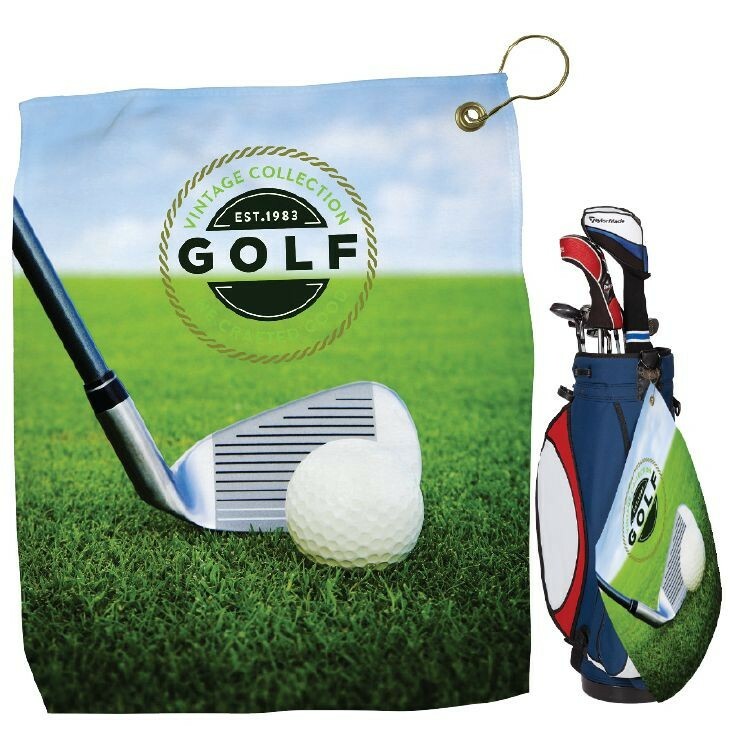 Measuring 16" x 25", this innovative microfiber golf towel has anti-scratch scrubber loops on the back side to clean club head or golf ball. It's designed to dig deep into the groves of the golf club. 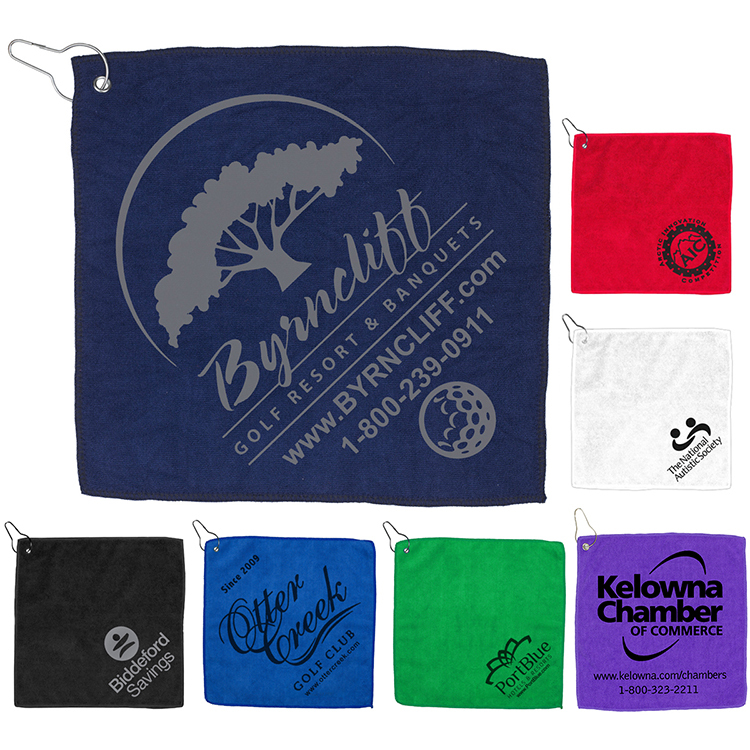 Great for promotional events, the front side is soft absorbent microfiber that can be embroidered or edge to edge printed with your company logo or custom design. Upper left corner hook and grommet included. This durable towel will last for years to come. 100% Turkish cotton, double sheared with dobby end hems. Hook and grommet not included. Product Colors: White. This durable towel will last for years to come. 100% Turkish cotton, double sheared with dobby end hems. Hook and grommet not included. Tone on tone with embroidery. Product Colors: White, Beige, Gray, Yellow, Navy, Black, Red, Maroon, Evergreen. Blank pricing is for colored towels unless otherwise specified. 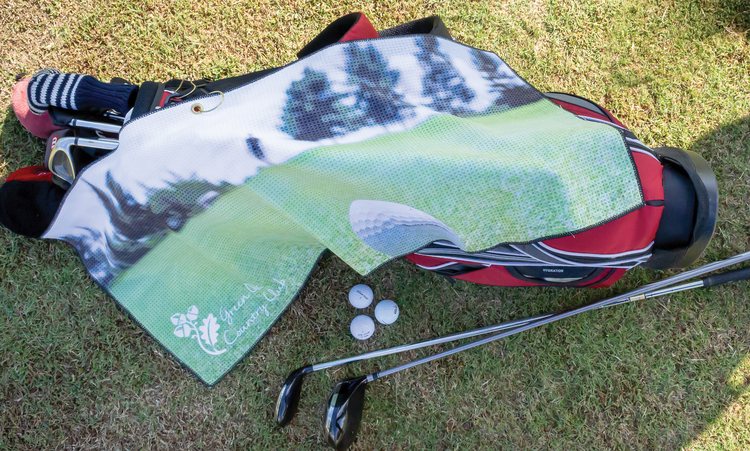 Based on the success of our popular Links Caddy Towel, we added this standard-size microfiber waffle weave golf towel. 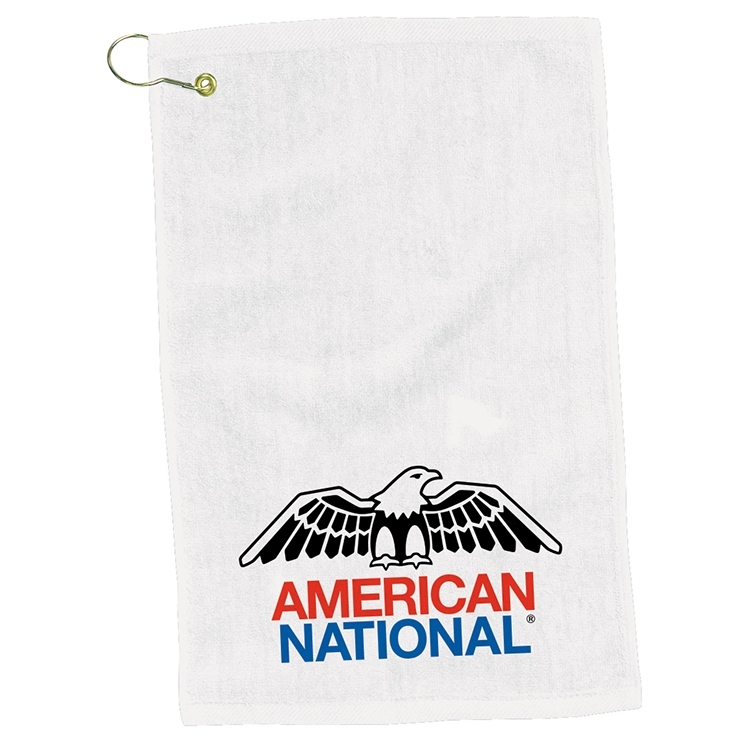 This absorbent white towel has a stylish black border to accent your logo plus a twill strap for easy hanging. Our Turkish heavyweight towel is our best seller. With just one touch, you'll see why. Each of our Turkish towels is crafted to our demanding specifications and features stylish dobby borders. Optical brightening and a double-shearing process result in a flaw-free finish that showcases your corporate logo for many, many years. 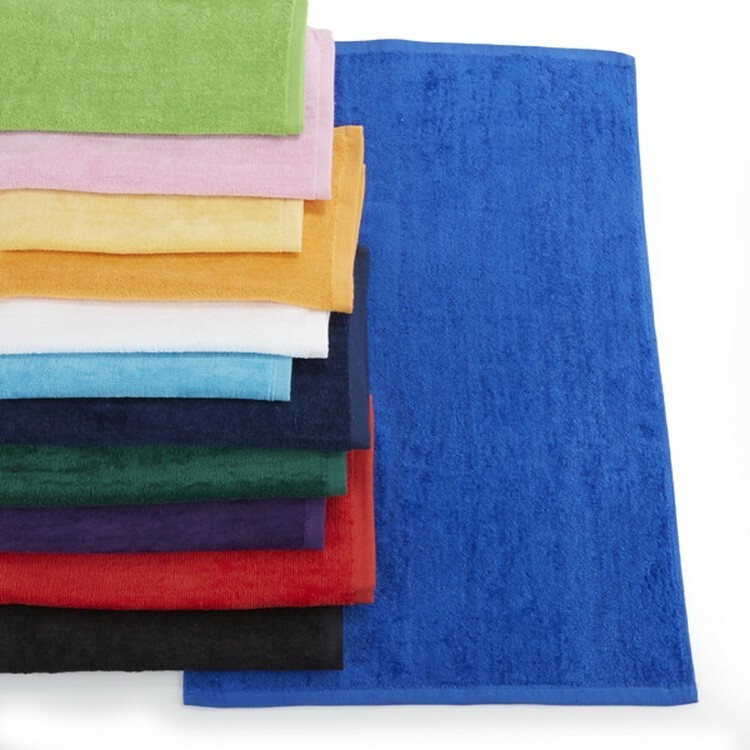 Combined with our award-winning decorating capabilities, rest assured that you'll receive the highest quality towel available.Product Colors: White, Pink, Red, Black, Royal Blue, Athletic Gold, Purple, Light Blue, Beige, Fuchsia, Yellow, Gray, Maroon, Evergreen, Tangerine, Navy, Lime, Turquoise. Blank price is for colored towels unless otherwise indicated. 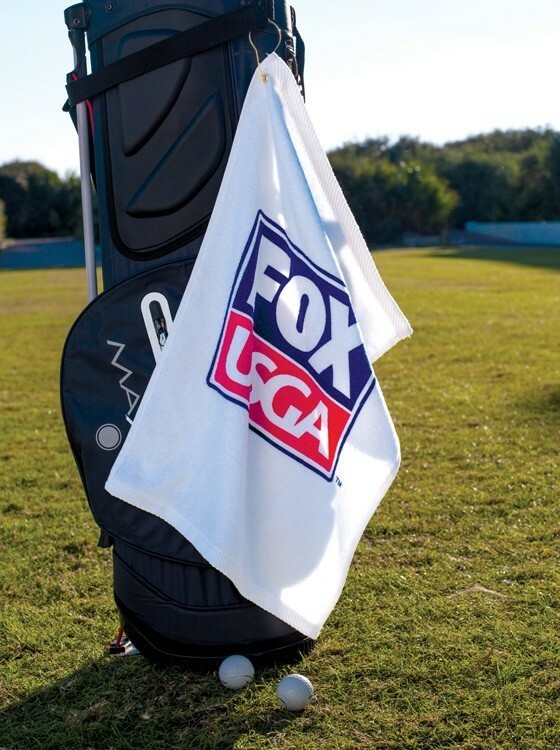 15" x 18", 1.8 lb./dozen, 80% polyester/20% polyamide, microfiber waffle golf towel. Includes corner grommet and hook. Boost your brand in brilliant color with Pro Vision! - Strikingly clear full color graphics. 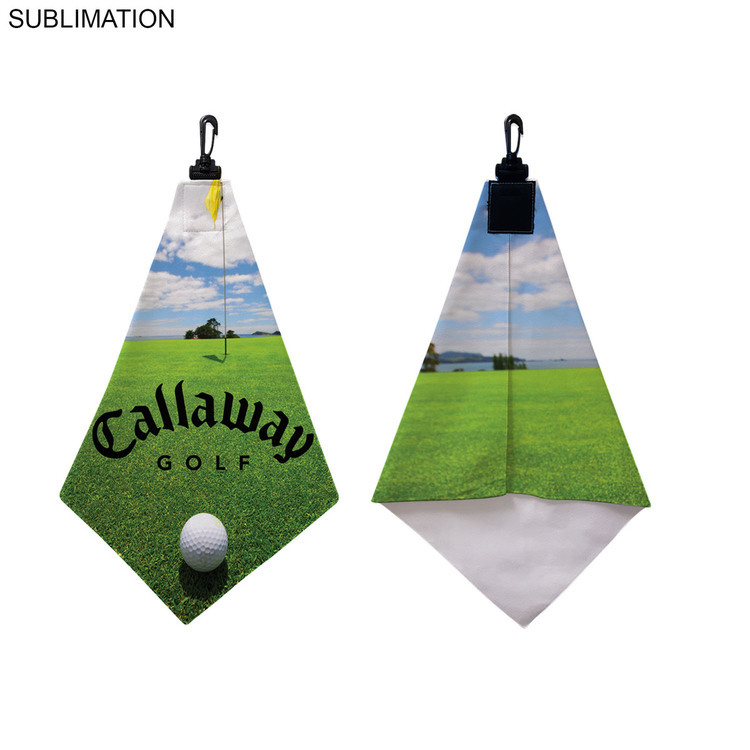 - Edge to edge sublimation – your artwork will be showcased to the full size of the towel. - Soft to touch, photo realistic images. - ONE piece minimum. No set up charges. 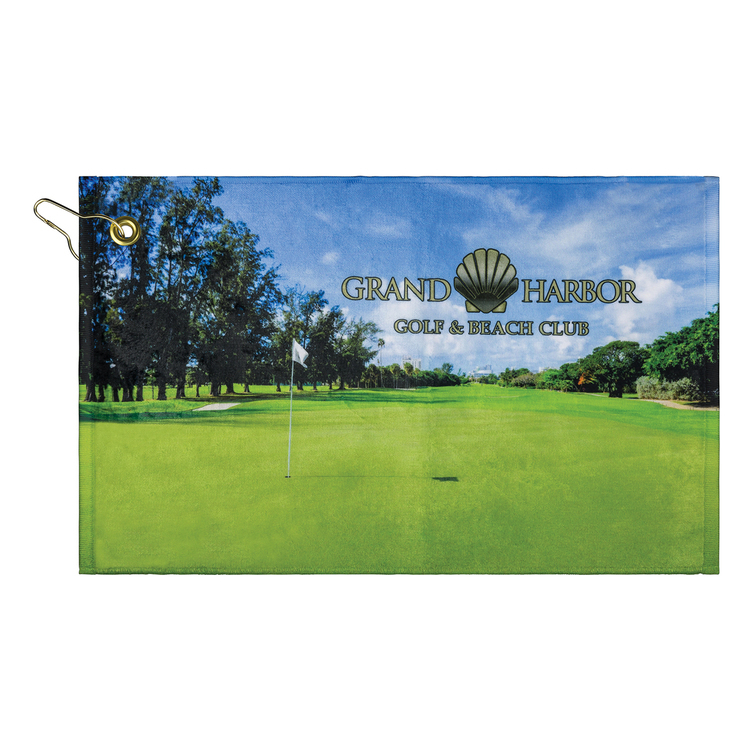 15" x 18", 1.8 lb./dozen, 80% polyester/20% polyamide, microfiber waffle golf towel. Includes corner grommet and hook. 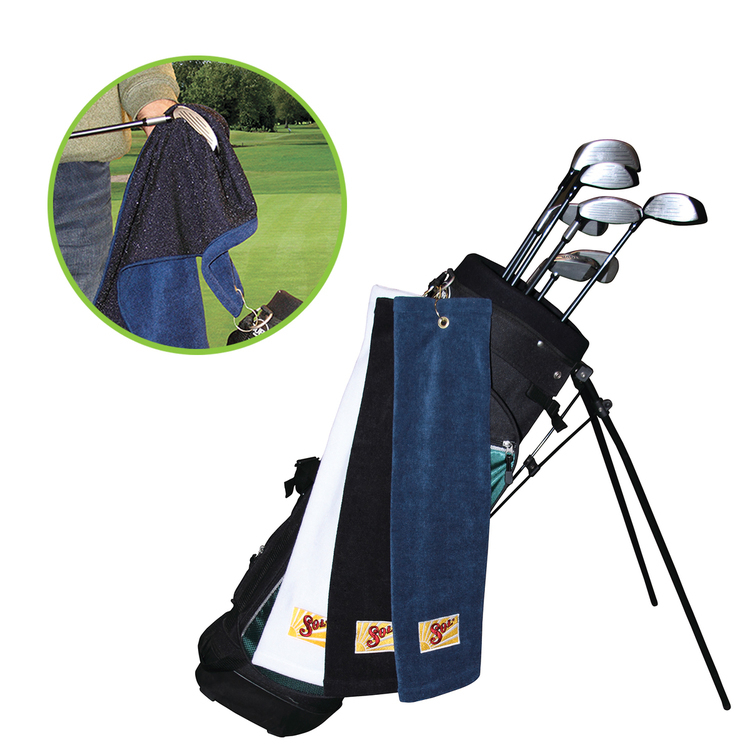 17" x 40", 4.8 lb./dozen, 80% polyester/20% polyamide, microfiber waffle golf towel. Includes corner grommet and hook. Boost your brand in brilliant color with Pro Vision! - Strikingly clear full color graphics. - Edge to edge sublimation – your artwork will be showcased to the full size of the towel. - Soft to touch, photo realistic images. - ONE piece minimum. No set up charges. 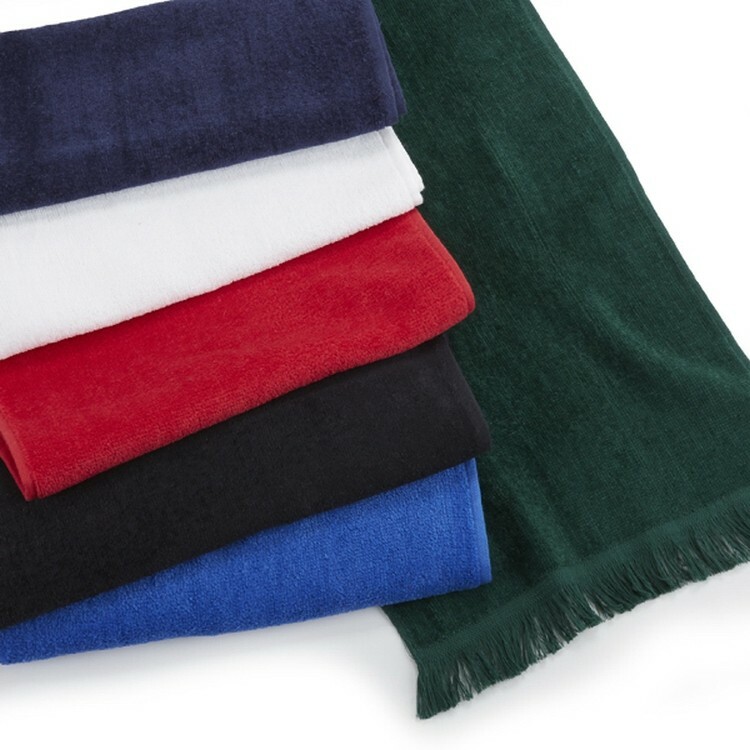 Terry velour fringed 11x18 fingertip towel. 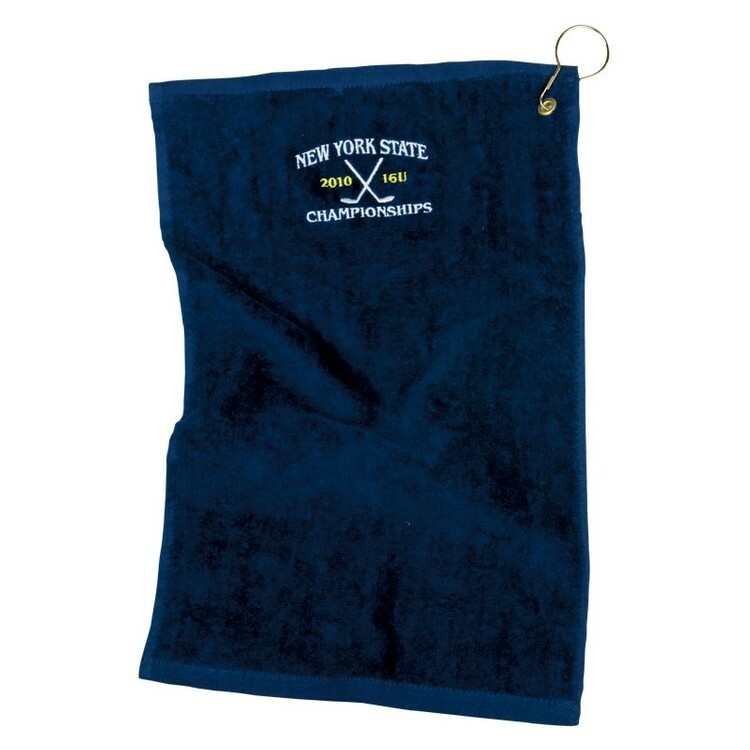 This is an excellent fingertip towel for stadium give away with fringed on both ends great for school & college games golf tournaments rally towel, self promotions smooth velour surface for excellent printing can be used as a hand towel 1.3 lbs/doz.